A burger at the Can't Fail Cafe in Emeryville. Emeryville is unlike most other cities in the Bay Area in that it lacks a proper downtown, most homes are condos or apartments, and everything seems so new and post-industrial. But it has a charm to it that I love, even if it lacks a rich restaurant scene. Can’t Fail Cafe is tucked away in a little corner of Emeryville, and it’d be easy to miss except that there are always huge crowds of hipsters outside waiting to be seated. Co-owned by Green Day’s bassist Mike Dirnt, the restaurant has an alternative vibe, down to the rows of Barbie dolls displayed across the walls. While I don’t go to diners often, Can’t Fail Cafe prides itself on quality ingredients and it shows. I usually order breakfast there, but on this visit, I opted for a bacon cheeseburger with French fries. This is actually the first bacon cheeseburger I’ve ever had. I’m not really a fan of hamburgers in general, but this was pretty good. 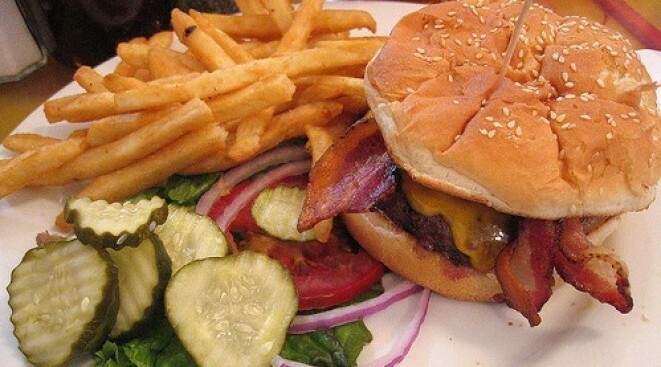 The burger was cooked to order, the bacon was crispy but not overcooked, and the cheese binded it all together. The fries were delicious too - the right thickness, salted perfectly, and fresh tasting. Can’t Fail Cafe is exactly the kind of diner I’d want in my neighborhood for a lazy Sunday breakfast or late-night sandwich. Unfortunately, it’s not in my neighborhood, but I make enough treks to Emervyille that I can almost pretend like it is.